The flowers came from La Mesa, the girl from Afghanistan. 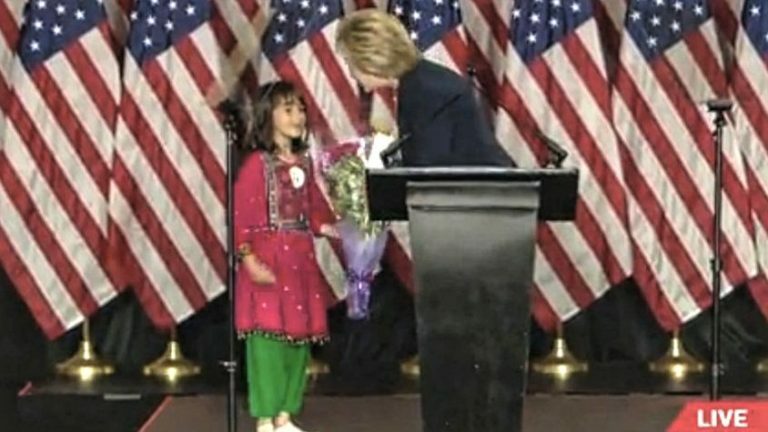 When Hillary Clinton accepted a large bouquet after her 35-minute Trump-bashing national security speech Thursday in Balboa Park, some assumed it was ethnic pandering. 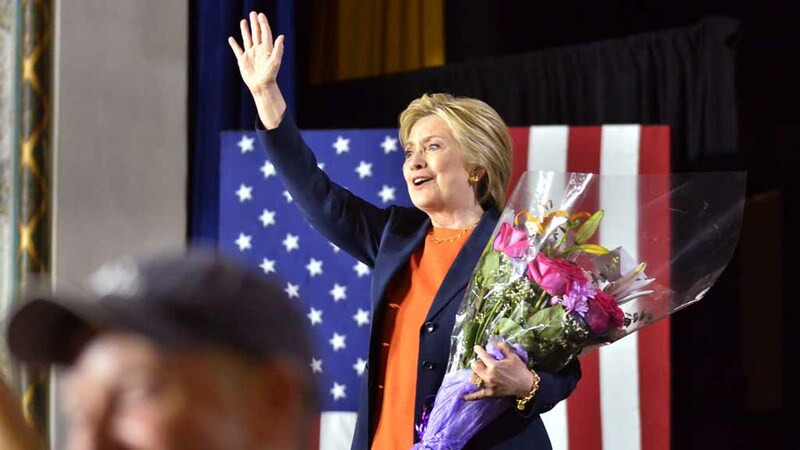 “Nice touch Hillary Clinton have a little Mexican give you flowers after your speech in San Diego. Get the Mex Vote,” said a comment on Twitter. In fact, 7-year-old Hatsanda Millatmal of Spring Valley and her dad came up with the idea. “She said she wanted to meet her because [she] wants to be a president in the future,” said her father, Dr. Tajuddin Millatmal, who didn’t tell her she had to be U.S.-born. Millatmal, 62, told his daughter: “I will buy you some flowers, and you will give it to her.” He picked them up at a La Mesa store whose name he didn’t immediately recall. Turns out Clinton should have been presenting flowers to Hatsanda (whose “S” is silent). A second-grader at Highlands Elementary School, Hatsanda has been hailed “The Little Ecologist” and “green warrior” for her efforts to encourage tree-planting by schoolchildren. Her goal is to plant trees every year in a different country. She’s already done so in the United States, India and Afghanistan. Her dad has some impressive credits as well. Born in the rural Afghanistan village of Shullana, Millatmal graduated from medical school in Kabul in 1976 but was forced to flee his country after spending a year jailed and tortured by the communist government, said one account. “He joined the Mujahadim to fight the Russian invasion, but his opposition to Islamic extremism within the freedom fighter movement compelled him to flee to Pakistan in 1980 where he worked with other Afghan refugees,” it said. 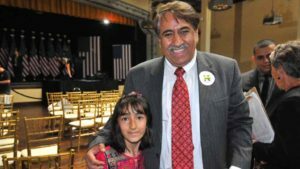 A U.S. citizen since 1996, he became a founding member of the Afghan Doctors Society, Medical Education and Training for Afghan Women in Pakistan, and the Afghans Health and Social Assistance Organization. He worked to elect President Ashraf Ghani in 2014. In 2010, he joined the Islamic Peace and Reform Movement of Afghanistan. In 2000, he established a group called HIPP — Humanity International for Peace & Prosperity: A Charitable Organization Extending a Helping Hand to Rural Afghanistan. He wrote that he “could not embrace the inhuman, anti-democratic, imposing power of the Islamic extremists in the so-named Holy War. In 1980, I was threatened and forced to leave my beloved homeland and took refuge in Pakistan. On his website, he said he was interviewed twice by NBC and CNN about the “negative policies” that supported the Islamic extremists. He spoke of none of that Thursday in the Prado Ballroom. His focus was his daughter and Clinton, saying he’s undertaken a nationwide effort to recruit Muslim communities to push back against Trump’s Muslim-ban ideas and back the Democratic front-runner for president. His goal is to set up a “big event” where America’s Muslim community endorses Clinton. His other goal: Help his daughter get the city of San Diego, if not the San Diego Unified School District (he’s had no positive response from school officials), to agree to a program of children planting trees in parks with their names on them. He says his wife wasn’t at the Clinton event because she was at school studying English. Young Hatsanda boasted fine English after only one year in America. What did she think of Hillary’s speech? Is she worried about Trump? Would Hillary be better than Trump for nature? What did she like most about Hillary? That was the best Hillary always is the stronger candidate, when the music played horns I cried when the little girl gave Hillary flowers..
À San Diego Hillary Clinton quitte la scène avec un bouquet de fleurs offerts par une petite afghane.